The UNISECO project is managed through nine work packages (WP), each of which oversees and/or are responsible for various parts of the three-year project. This is illustrated in the chart below. To view project outputs and deliverables, please go to Resources. The overall objective of WP1 is to create and sustain the conditions for the successful implementation and completion of the research and encompasses all activities dealing with the administration, management, coordination and monitoring of project activities. It manages and monitors the evolution of the project, facilitates communication with the partners and the European Commission, organises and facilitates project meetings, administer contributions from the international UNISECO Project Advisory Group, partners, and MAPs, and establish and manage the project intranet site. UNISECO addresses the challenges stated in the call in an adapted socio-ecological systems (SES) framework that provides a consistent theoretical framework of analysing the dynamics and implications of socio-ecological interactions in farming systems across different spatial and temporal scales. Specifically, Ostrom’s original framework will be adapted to integrate farm economics and define sets of variables for the analysis of the different SES subsystems at farm level (WP3) and territorial level (WP4). The overarching aim of WP2 is to provide a conceptual framework for the project and to ensure a consistent theoretical underpinning of the practice and policy recommendations in WP6. The development of the conceptual framework in WP2 builds on 1) existing theory and approaches in relation to socio-ecological systems and 2) the analysis of different eco-functional intensification paths across the EU. The SES framework will be adapted for the sustainability assessment of farming systems and operationalised to ensure its consistent application in WPs 3 to 6. The conceptual tasks in WP2 also include guiding a consistent case study design and selection process with the MAPs (WP7), building on a robust typology of AEFS in the EU. The typology produced will inform the design and selection of case studies ensuring a consistent coverage across assessment variables of the adapted SES framework, and the types of farming systems and their socio-economic and political settings in the EU. Using the findings and experience from carrying out the analytical studies in WPs 3 to 5 as well as the integrated sustainability assessment in WP6, a revision of the adapted SES framework for the sustainability assessment of EU farming systems will be considered. WP3 is at the core of the case studies and analyses the environmental and socio-economic performance of AEFS and sustainability trade-offs of innovative management strategies, market incentives and policy instruments at the levels of farms, farm households, groups of farms and farming systems. Participatory decision support tools (SMART Farm Tool, Cool Farm Tool and COMPAS) are used to engage a range of actors in the sustainability assessment of AEFS in the case studies. The assessment of current approaches provides the status quo in terms of resource use, provision of public goods, production of market goods and utilisation of labour and knowledge in comparison to conventional systems. The decision support tools are tailored to the specific contexts of the case studies and respective actors by iteratively updating them with new indicators and stakeholder needs and preferences. The use of the decision support tools with advisory services, farmers, and other relevant actors in combination with farm surveys and interviews with actors in the value chain, consumers, educators and policy makers will enable the identification of processes in decision-making and interactions within the farm household and between different actors which led to the status quo of the performance of AEFS. A qualitative assessment of processes will improve the understanding of barriers in implementing agro-ecological approaches across case study contexts. WP4 complements and contextualizes farm level findings from WP3 in the territorial context, including wider societal needs and priorities, and deliver the external social, economic, ecological dimensions to the farm level assessment. Based on a review of drivers and trends, scenarios will be developed and assessed with regional, national and EU level stakeholders to frame the option space of social, economic, environmental and policy drivers for the farm and territorial level assessments (WP3 to WP5). The territorial assessment will use a nested approach by assembling and integrating data at the regional (e.g. NUTS-2), national and EU wide level. WP 4 is assessing the territorial implications of innovative strategies (co-constructed in WP3) and market and policy incentives (co-constructed in WP5) for AEFS and assess selected global impacts (e.g. international trade, GHG emissions) using biophysical and socio-economic modelling approaches such as the BioBaM and SOLm models. These modelling approaches provide a systematic link between production and consumption systems, which is the basis for an overall assessment of trade-offs and synergies between private and public good provision. WP5 addresses the critical role of governance and policy design for the sustainability assessment of AEFS. The main aim of WP5 is to analyse the governance structures, market incentives and policy instruments supporting AEFS. Complementing the review of drivers and the typology of AEFS (WP2), an inventory of relevant existing market incentives and policy instruments will be produced. The inventory will consider both pillars of the CAP, EU environmental directives, climate change policies, labour policies and national/regional policies and initiatives of the private sector. 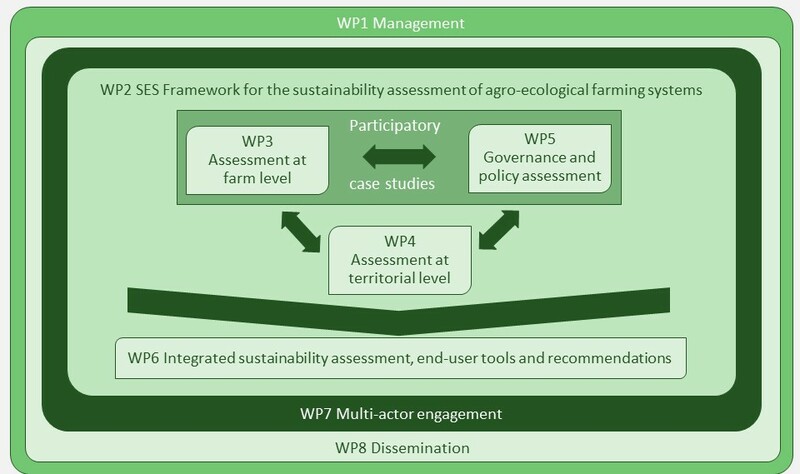 WP5 will also assess the main governance arrangements which, at different geographic and institutional levels, are able to support agro-ecological approaches in a more efficient way. Innovative market incentives and policy instruments for AEFS will be co-constructed with local stakeholders on the basis of innovative approaches currently planned to be implemented, and the main drivers and barriers for policy innovation and replicability. The sustainability implications of the co-constructed incentives will be assessed at farm level (WP3) and territorial level (WP4), in order to draw lessons for local actors, businesses, stakeholders and policy makers (WP6). WP6 synthesises key findings from WPs 3 to 5 into an integrated sustainability assessment of AEFS within a consistent SES framework. The final sustainability assessment will validate the suitability of the set of variables defined within the conceptual SES framework (WP2) and inform revisions of this framework for future sustainability assessments of farming systems. The synthesis will form the basis for key end-user outputs of the project, which will be developed in close collaboration with the MAPs and the EIP-Agri Service Point: a) spatially explicit interactive online tool summarising the synergies and trade-offs of the agro-ecological approaches, market incentives and policy instruments built around the adapted SES framework; and b) a methodological handbook for integrated assessments of the sustainability of farming systems. The online tool and handbook will form key elements of an agro-ecological farming knowledge hub developed in WP8. The development of the end-user output will build on the experience of the consortium in other EU projects such as such as BONUS BALTICAPP, OpenNESS, PEGASUS, OPERAS, PROVIDE, ENVIEVAL and AgridemoF2F. Recommendations for strengthened transdisciplinary research and support for relevant EU policies will be derived and validated with the MAPs. At all stages of the project, multi-actor engagement (WP7) is used to ensure the consistent application of transdisciplinary methods. This helps identify and refine specific research questions and tools, providing feedback on intermediate results and discussing and validating research outputs and evaluating the robustness of management strategies and policy recommendations. Taking into account of the approaches developed and lessons learnt in previous projects, MAPs will be set up for the case studies in each partner country and at EU level. The transdisciplinary approach, embedded in the composition of the consortium partners, will strengthen the capacity of the project partners and the stakeholders and end-users to assess the sustainability of different agro-ecological approaches and to prioritise policy intervention needs. WP8, which runs for the duration of UNISECO and beyond, deals with the external communication actions that address continuous multi-channel dissemination of project information, developments and results. WP8 will provide the agro-ecological farming knowledge hub, which, in addition to the spatially explicit interactive online tool and methodological handbook, will host a hub network facility for promoting cooperation and implementation of agro-ecological approaches of farming systems, as well as for providing a platform for continued knowledge sharing and capacity building as a project legacy. Communication activities include a clearly structured, well-designed and up-to-date website, networking with relevant projects, and the production and dissemination of project videos, posters, leaflets etc., as well as technical and scientific articles in magazines and journals, using Open Access (OpenAIRE) for boosting impacts and effective dissemination of key findings. This is a technical Work Package that sets out the “ethics requirements” (POPD, NEC, EPQ, H) with which the project must comply with. This website reflects only the authors' view and that the European Commission is not responsible for any use that may be made of the information it contains. © 2018 — GEO UNISECO All rights reserved.